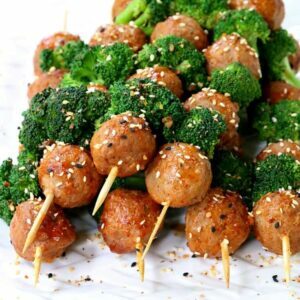 These Korean Beef and Broccoli Meatball Kabobs are a sponsored post written by me on behalf of Cooked Perfect® Meatballs for PayPerPost. All opinions are 100% mine. 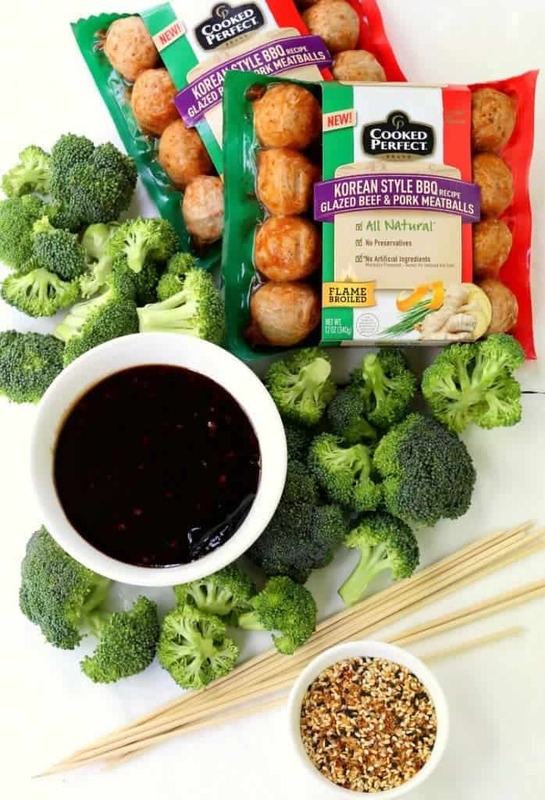 These Korean Beef and Broccoli Meatball Kabobs are a fun and quick dinner your family is going to love! 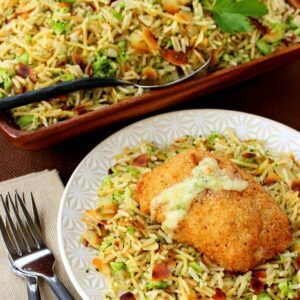 Weeknight dinner don’t get much better than this! I don’t know what it is about kabobs that makes dinner seem so much more interesting. I can probably put most any vegetable on a stick and my kids would eat it. Food on a stick is just a lot more fun. 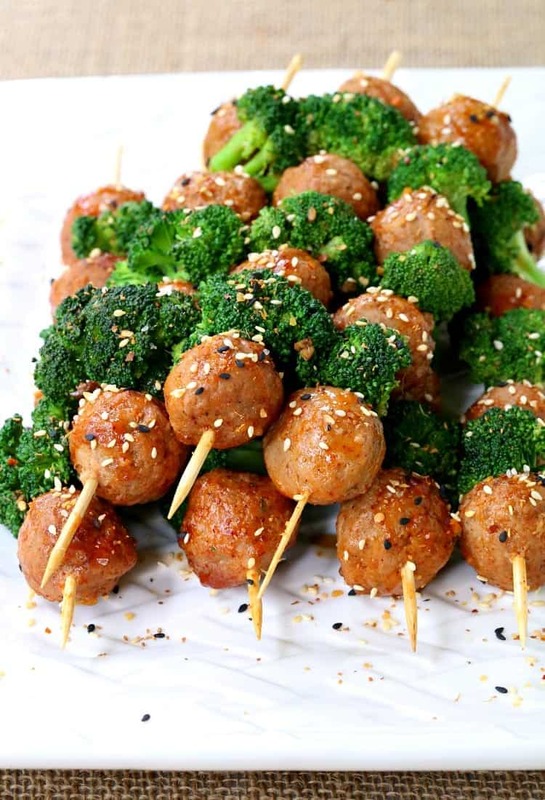 These Korean Beef and Broccoli Meatball Kabobs are not only fun but they’re really, really tasty. You can Find Cooked Perfect Fresh Meatballs in the refrigerated meat and poultry section, and when I did I knew I had to grab them. I ended up getting a few packs because my boys are going to love these meatballs…and I had an awesome recipe idea to make with them. One of the dinners we make often is stir fry, beef and broccoli is always on the stir fry menu. A quick sear of your beef, a simple sauce and some steamed broccoli. 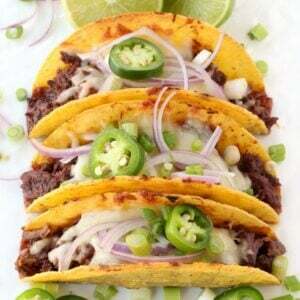 My boys go crazy for it – definitely one of their favorite dinners. 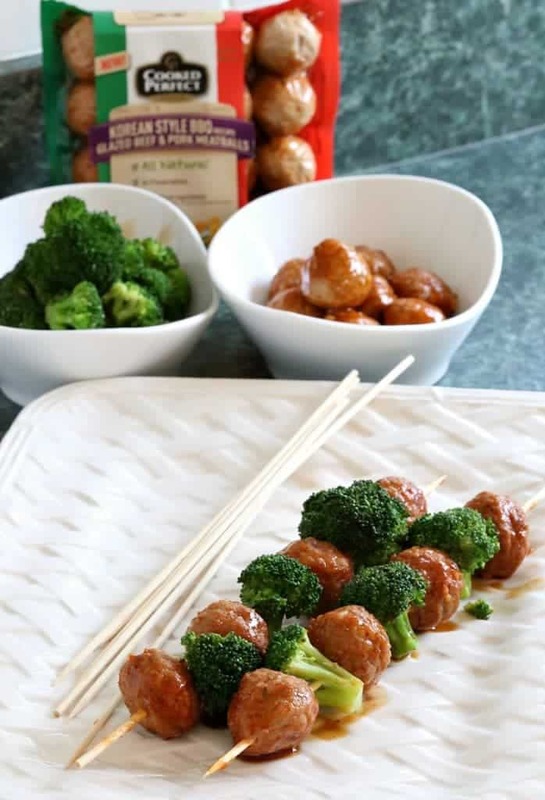 So I thought instead of doing stir fry, why not use these Cooked Perfect Fresh Meatballs that are already flavored and read to go within minutes in your microwave and just add the broccoli? With no artificial flavors or preservatives, you know you’re serving a meal that’s not only good but good for you and your family. AND then put it all on a kabob. This was going to be a weeknight family dinner win. So these meatballs are fresh, not frozen so grab them over by the meat case in you grocery store. And did I mention that they cook right in the microwave, but they actually cook right inside the pouch that they are packaged in so the flavor stays right inside. Doesn’t get much easier than that, does it? I like to steam broccoli in the microwave too, just with a little water then covered with plastic wrap. It only takes about 2-3 minutes depending on how much you have in the bowl but it comes out perfect every time. Before you get all that going in the microwave, you’re going to make an easy sauce for the broccoli. The meatballs are already glazed so they’re going to go on the skewers as they are, but the broccoli is going to take a dip in this quick sauce. 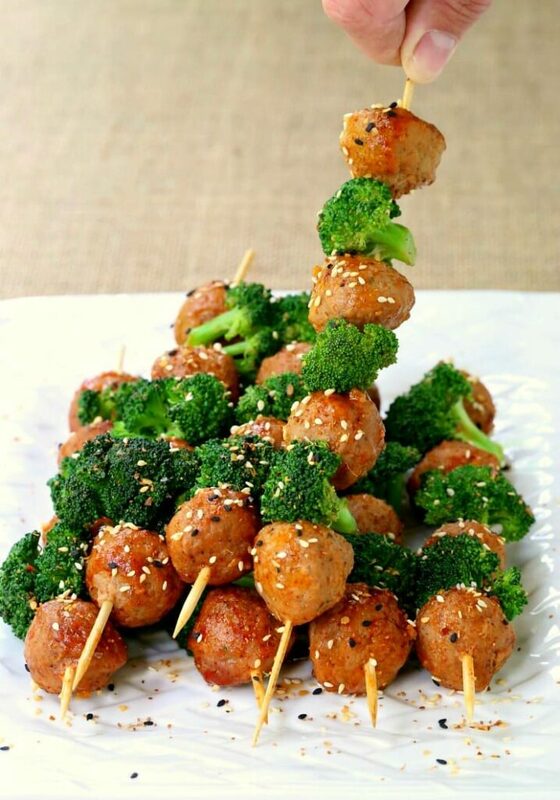 Now the sauce is made, the meatballs and broccoli are hot, you just have to get them onto wooden skewers and serve. That’s it – 15 minute (or less) dinner is on the table. I mean, this has got to beat whatever you were thinking of ordering out for. When I can get a meal that looks as good as this on the table as fast as these kabobs, you know it’s going to be clean plates all around. 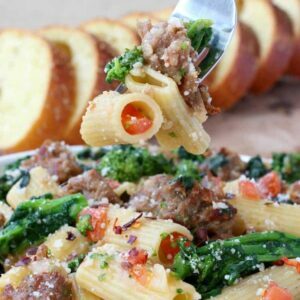 A quick and healthy dinner that uses some help from the store to get this meatball and broccoli dinner on the table fast! Make the meatballs according to the package directions. Remove from the packaging and place in a bowl. Stir the ingredients for the sauce together in a small saucepan. Bring to a simmer and let cook for 5 minutes, then turn off the heat and cover. Add the steamed broccoli to a bowl and pour a little bit of the sauce over at a time. You might not need it all, just so it’s lightly coated in the sauce. Grab a skewer and add a meatball, pushing all the way to the bottom. 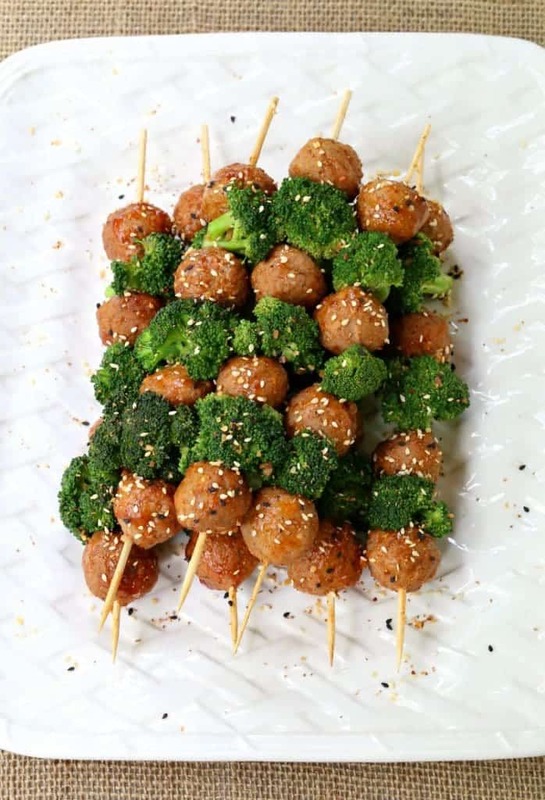 Alternate with a piece of broccoli and another meatball until you have 4 meatballs on the skewer. Repeat with the remaining ingredients so that you end up with 8 kabobs. Garnish with sesame seeds and serve with any extra sauce.